The fraudulent website “www.ghanairforce.com” which was set up by the Pink Aviation to state its case on the transaction it had with the Ghana Air force and was considered by the government and the Ghana Armed Forces as illegal is still the world wide web. This is at variance with the deputy information minister's promise to the nation that the government would immediately use all means including the courts to disable the website. But when The Chronicle newspaper spoke to the deputy information minister, Asamoah Boateng last Wednesday on the phone, he said the matter, which involves the Ghana Airforce has been referred to the attorney general for advice. The most scurrilous thing about the site is the use of the country's coat of arms on the site. He said the government has taken on pink Aviation to disable the site because it did not have the authority to use the country's coat of arms on their website. 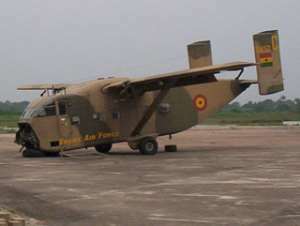 The site was established, according to Pink Aviation to protect aircraft buyers and when dealing with Ghana Armed Forces and to state that the Ghana Air Force does not own any more any Short's Skyvan SC7. Meanwhile, information gathered from the deputy minister of information indicates that the committee that was set up by the Minister of Defence, Dr. George Addo Kufuor to probe the transaction started work earnest and they are about to complete investigations. The Chronicle brought to the public domain the dubious transaction between the Pink Aviation of Vienna and the Ghana Airforce some few weeks ago. Touching on the CNT loan saga, the minister said it is the parliament that the loan was contracted by the whole house that is parliament so he does not understand why the other section of the house would come out against it. He told The Chronicle that the Finance Minister Osafo Maafo would soon come out with the details of the loan.